I've spent a good enough amount of time over the last year absolutely tearing this series apart in many regards. It was uneven at best, borderline-unreadable at worst, and even some of the things set up for Brandon Sanderson to sort out wasn't looking good. Even with all that in mind, however, I still found myself extremely excited for A Memory of Light to end up on my doorstep. The basics are simple - the book is effectively 900 pages of action. From tying up the political loose ends to seeing the strategic maneuvers on the battlefields to Rand, basically alone, fighting against the Dark One, the book just moves at a breakneck clip. 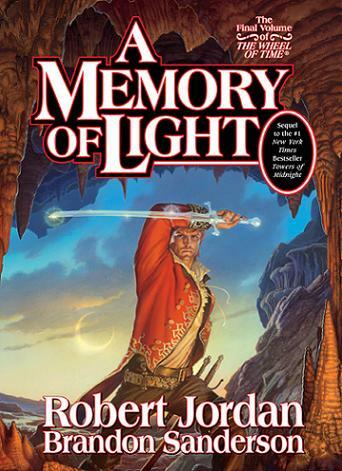 With a good bulk of this written by Jordan in a place where the books were traditionally at their best, it means that, unlike with the other two Sanderson volumes, we're getting the best of both worlds here. * The actual Last Battle with Rand. I really did not expect the way this happened at all, and yet it was a really delightful way to do it. The idea that Rand and the Dark One were battling not for individuals, but for ideas is something that resonates well with me and ultimately with the way the series went as a whole. It doesn't completely validate the way the series was written on a whole, but it certainly validates the concepts within. * Perrin and the Slayer. I didn't spend a ton of time considering that while leading up to the final book, but in terms of unexpected pleasures, the way those battles were woven throughout were excellent. * The fact that Loial got to do his part warmed my cold, cold heart. * Egwene. Her transformation and strength over the last four books in particular really made me appreciate her character more and she's now become on of my favorites in fantasy. * The way the Darkfriends worked. It was a validation of sorts of my early belief that they were scarier than trollocs, and the fact that they nearly combusted the whole thing before it started was just masterful. * The Mat storyline never really panned out for me. I get the choices made, I get the need to make him into what he became, but for a storyline that never meshed for me to begin with, I was hoping that it might get repaired like so many others. Ultimately, A Memory of Light exceeded my moderate expectations, and likely would have exceeded higher expectations as well. It would be interesting to do a machete-style edit of the first 10 books or so to boil down a lot of the plots to their collective essence and see what a leaner series might look like, but as a three-book finale, as a one-book finale, as a whole piece, my regrets that I felt throughout the summer and fall have ultimately melted away and I've come to largely appreciate my Wheel of Time experience.